Blend coconut, sugar, flour, vanilla extract, almond extract, and salt in a food processor until combined, about 30 seconds. Beat egg whites in a bowl until soft peaks form. Fold coconut mixture into egg whites until just combined. Wet your hands. 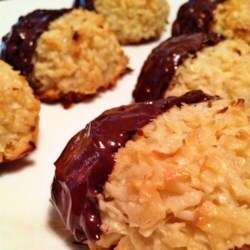 Roll spoonfuls of coconut mixture between palms to golf ball-size cookies; arrange on the prepared baking sheet. Bake cookies in the preheated oven until coconut is slightly golden and toasted, about 15 minutes. Transfer to a wire rack to cool, 30 minutes. Line baking sheet with new piece of parchment paper. Melt chocolate chips in the top of a double boiler over just-barely simmering water, stirring frequently and scraping down the sides with a rubber spatula to avoid scorching. Dip half of each cookie in the chocolate and place on the prepared baking sheet. Place in refrigerator until chocolate is set, about 15 minutes.